Housemade pickled onions serve as a sour counterpart to rich pork-belly skewers served at Blue Ribbon Sushi Izakaya in New York City. Photo courtesy of steve hill. Sour. The word lacks charm, but holds so much dimension and possibility. We’re declaring 2014 as the year in which chefs will unleash its bracing, acidic, palate-cleansing potential. Often relegated to being a background player, sour is stepping out with big moves. Mustards, varietal citrus, the pickling trend, yogurt, kimchi, vinegars—all have crept up on consumers, reminding them that there is indeed a place for a refreshing hit of acidity. There is joy in sour flavors—beyond those crazy Sour Patch Kids. And sour does more than deliver mouthwatering, big flavor. It speaks to authenticity, one of the other significant markers for menu development this year and beyond. Sour ingredients that are handcrafted deliver a premium experience to today’s consumer, who is seeking out craftsmanship in the professional kitchen. “Quick pickles, housemade mustards, gastriques and unique vinegars are all ways to add sour notes and handcrafted value to the menu,” adds Perez. The adventurous consumer has opened up the world of sour flavors, too. Countries like the Philippines have a longstanding love affair with sour elements, usually introduced through coconut or cane vinegars, and as a stringent counterpoint to sweet and salty profiles. Middle Eastern cuisines love tart flavors: Pomegranate, drinking vinegars and citrus-finished grilled meats punctuate an affinity for sour. Other ethnic favorites push the diner into sour nirvana—ceviches, escabeches, Lambic-style beers, not to mention the many fermented products. As diners’ access to global flavors becomes more commonplace, they start to respond to those flavor notes closer to home. 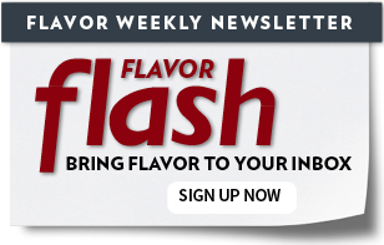 Flavor presents sour’s biggest menu opportunity. It’s bold, it’s bright, and you don’t need a lot of it to make a great impression. “It adds interesting flavor dimensions to foods, giving simple dishes huge flavor,” says Technomic’s Darren Tristano. Eric Stangarone, executive chef and creative lead at The Culinary Edge, agrees. “By taking an existing dish and adding something as simple as a smear of mustard on the plate or a side of a pickled vegetables, you’ll be able to deliver a high-impact flavor contrast that will augment all of the flavors on the plate,” he says. Melissa Abbott of The Hartman Group sees sour as a great enhancing agent. “Sour beers, vinegars and citrus can best be leveraged as a glaze or flavor boost, brightening up roasted and braised foods for a more complex, yet fresh flavor profile,” she says. Small-plate menus are a natural setting for complementary sour profiles, from the many pickled offerings to mustard’s varying flavors and applications. We’ve watched happily as the art of pickling has taken root on menus, both adding sour elements on a plate and tying in a homey, much-loved tradition of preserving. “Sour is here to stay,” says Maeve Webster, Datassential’s senior director. “There’s no doubt about that. Pickling is among one of the hottest trends driven both by the need to do something with all of the uber-fresh farmers’ market produce and by ethnic cuisines that feature pickled ingredients, such as trendy banh mi sandwiches.” Pickling is accessible, and it speaks many languages. Indeed, one branch of this trend sees a bevy of local and fresh produce granted new dimension and menu interest through pickling. Pickled summer beans at Chicago’s Perennial Virant. Pickled peaches at Urban Farmer in Portland, Ore.
We’re also seeing a move out into ethnic traditions around pickling, such as the chilero, spicy pickled vegetables at Lolinda in San Francisco. For the pickled peanuts at Craigie on Main in Cambridge, Mass., chef-owner Tony Maws first toasts the peanuts, then immerses them in a pickling liquid of brown sugar, fish sauce, ginger, garlic, chiles, cider vinegar and soy sauce. “The peanuts are rich, so the pickling balances out the flavor,” he says. He serves them with crispy-fried pig’s tails, nuoc cham and cilantro. At The Root in White Lake, Mich., executive chef James Rigato looks to Middle Eastern flavors for his house-pickling flavor combinations. For a pickled vegetable dish, he quick-pickles cabbage, onion, carrot and cucumber in distilled white vinegar, hot Chaldean curry powder, turmeric, lemon, garlic and sugar. As a society, we’ve moved well past honey mustard and yellow mustard—though each of these hold their place in some wonderful classic favorites. But flanked by gastropub fare on one side and street food on the other, mustard is having a moment. Whole-grain varieties bring bravado to pretzel bar bites. Housemade condiments involve chefs tinkering with mustards in intriguing fashion. At Miami Beach’s Tongue & Cheek, housemade pretzels are paired with purple mustard (port wine, red wine and dried cherries cooked down with onion and Dijon). Tongue & Cheek also serves baked chicken skins with Japanese mustard (Colman’s mustard, seaweed, rice wine vinegar, sugar and lime juice). “Mustard brings a different kind of heat,” says chef Matt Christianson of Urban Farmer in Portland, Ore. “It’s sharp, it’s sour, but it doesn’t linger.” He pickles mustard seeds until they’re plump, then tops braised mustard greens, kale, Swiss chard and collard greens with a mustard seed-onion relish. He also uses the pickled mustard seed, or as he calls it, “mustard caviar,” as a garnish to smoked salmon and vegetarian beet terrine. The beverage menu certainly deserves mention in a trend covering sour. Drinking vinegars, either diluted with soda or served in cocktails, are both tart and refreshing. Perhaps riding in on the wave of housemade sodas, they offer another fresh alternative at the bar. At Urban Farmer, Christianson uses the pickling liquid from his house-pickled fruit as components of his bar’s craft cocktails. And at Andy Ricker’s Pok Pok in Portland, Ore., and New York City, diners can order a multitude of drinking vinegars, including tamarind, pomegranate and Thai basil. Cocktails touting sour flavors are making themselves known. At Scotch & Soda in Springfield, Mo., Joshua Widner and Andrew Heilman crafted a menu of creative cocktails, some of which fall under flavor headings of Sour and Tart. Their Bella Morte is a sublime blend of Beefeater 24, strawberry, basil, simple syrup, fresh lime and aged balsamic vinegar, while the Blood & Sand sees Black Bottle Scotch, fresh orange and Dolin Rouge vermouth topped with Kasteel Rouge Sour Cherry Ale. Tapping into the desire for fresh, less-processed foods, fruit with sour flavors might be the easiest, most accessible path to this trend. Indeed, tart fruits like green mango, tamarind, tart cherries, blood orange and sour plums add bright acidity and bring pedigree to the table. “Virtually every operator from every segment can leverage the use of sour flavors,” says Datassential’s Webster. “All of these pickles, vinegars, mustards and so on can be used extensively by the operator across traditional and less-common applications.” It’s about time sour gets the respect it deserves for the crucial role it plays in the full flavor experience.